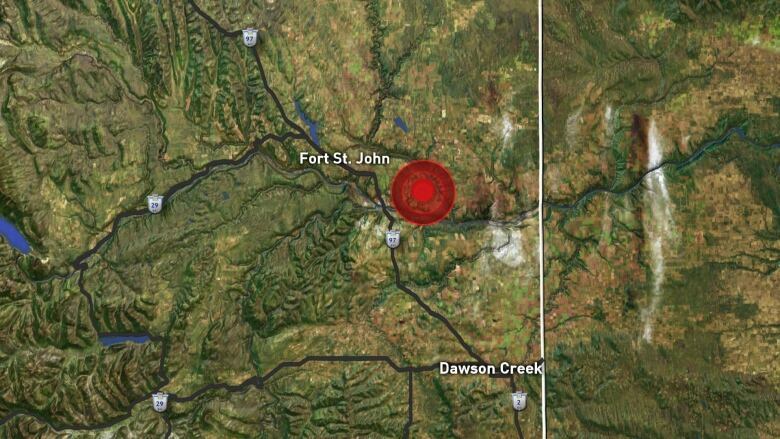 The quake was recorded about 16 kilometres from Fort St. John, according to Canadian officials. An earthquake struck an area in northeastern B.C. close to Fort St. John on Thursday after 5 p.m. PT. According to the U.S. Geological Survey, the quake had a preliminary magnitude of 4.2 and the epicentre was 22.4 kilometres southeast of Fort St. John. Earthquakes Canada reported an initial quake of 4.5 magnitude 16 kilometres southwest of Fort St. John, followed by a 4.0-magnitude aftershock 26 kilometres southeast of the city less than an hour later. People in Fort St. John, as well as Taylor, Chetwynd and Dawson Creek reported feeling the earthquake on social media, but there are currently no reports of damage. Honn Kao, a research scientist with the Geological Survey of Canada, said early data suggests the quake had a relatively shallow depth which is likely why the quake was widely felt. "This is certainly an event that has been felt quite a bit by the local residents," Kao said. "Although this is a significant event for the region I don't think it's going to cause significant damage." Although it is unconfirmed what caused this earthquake, Kao said the B.C. Oil and Gas Commission is investigating if the quake is related to hydraulic fracturing operations in the area. Hydraulic fracturing — or fracking — is when water, sand and other chemicals are injected underground at a very high pressure to fracture shale rock deep underground in order to extract natural gas. "They will have to link the location and time of this event to the injection operations nearby," Kao said. This area of the country — western Alberta and northeast B.C. — has a high rate of fracking-induced earthquakes, according to a study from the University of Alberta.